Easy calzones? You bet! 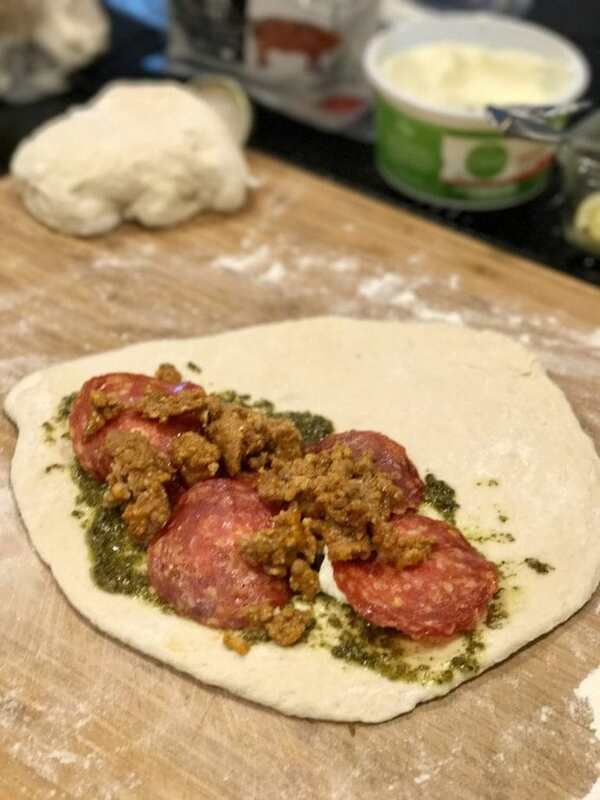 These calzones are chock full of your favorite pizza ingredients like pepperoni, Italian sausage, ricotta and Mozzarella cheeses, pesto, and much more. A fun twist on pizza night, or lunch or snack! I made them for our family as well as for another family that were in need of a meal. I bought a LOT of pizza dough, more than my little bread machine could have produced. 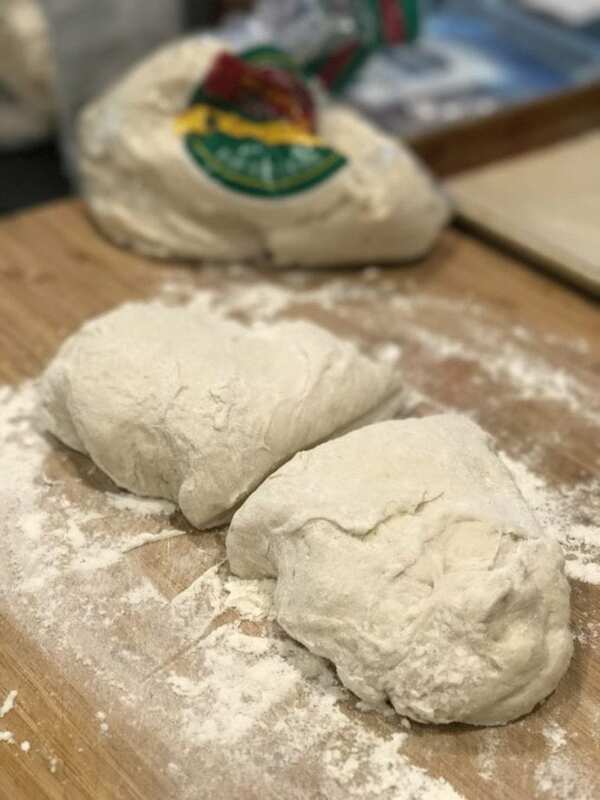 Typically one package of dough will make 3 small Calzone’s or 2 large ones, if you want to make a large, family style calzone, use the whole thing like you would a pizza. 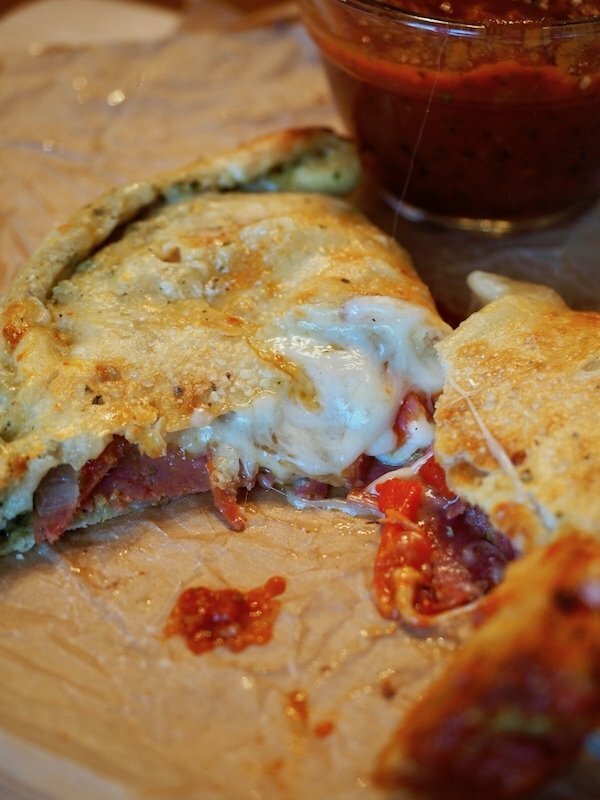 You can also make mini-snack size calzones, think of them as your personal pizza pockets! Reduce the fillings, making them the size of your hand instead. 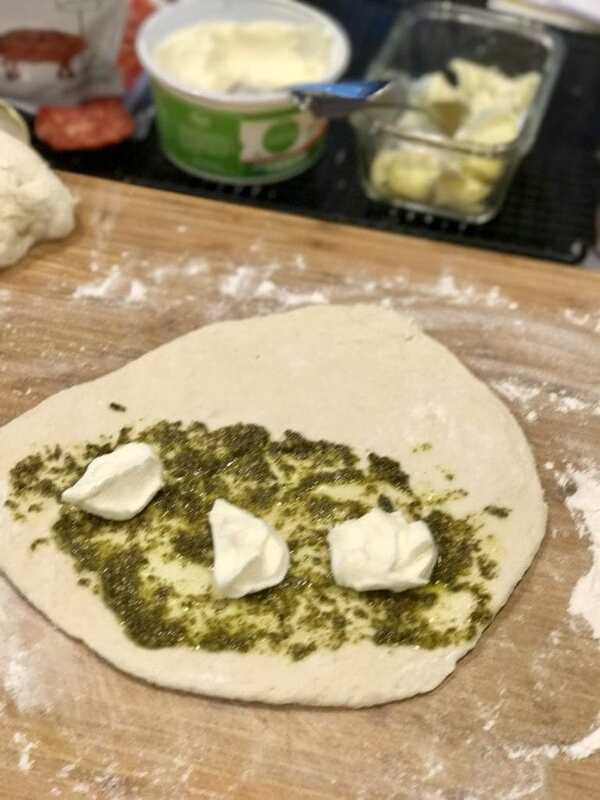 One thing I love about calzone’s is that they are totally customizable, alter the amounts and variety of the ingredients to each persons preferences. Start out by having all of your toppings open and ready, because once you get your hands dirty, you don’t want to try to open packages, get a spoon, etc. I know this, first (messy) hand! 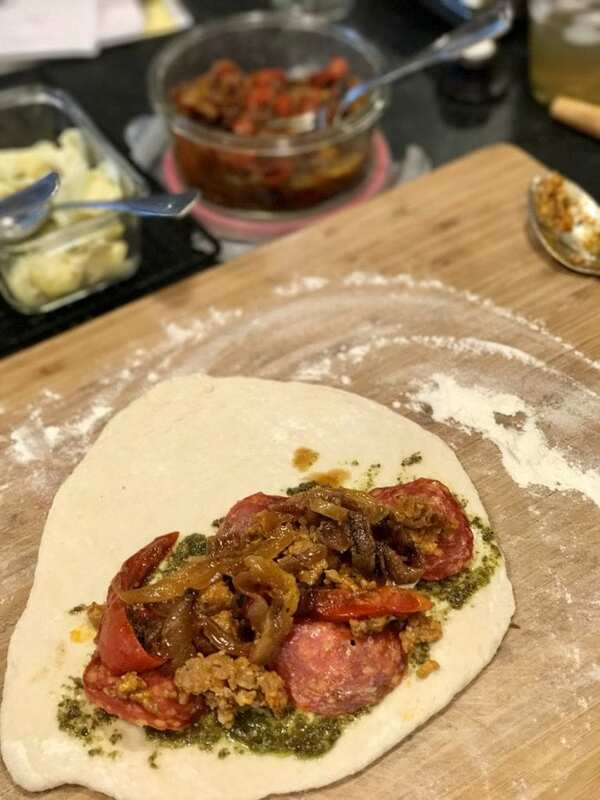 Suggested fillings are ricotta cheese, sun-dried tomatoes, pesto, pepperoni, Italian sausage, artichoke hearts and caramelized peppers and onions, olives, fresh onions, pepperocini’s or anything else you like on a pizza. When I was pregnant with our second son, my husband had to work back east for about 12 weeks, so with a toddler in tow and pregnancy cravings in full gear, and to help the long days without my husband around, I would walk across the street to a little Italian place to buy us dinner. It wasn’t fancy, you ordered at the counter and my toddler and I would sit share a calzone. Every bite was a surprise, I loved them then and still love them now. They were so good, I don’t think I’d put ricotta in mine up until then, that is a game changer in my book! We’d sit and watch a baseball game on one of the TV’s and have our dinner, it helped fill some lonely evenings, little blessings. Instead of looking back on that time with regret, I see it as what it was, a huge time of growth; difficult circumstances that God allowed in order to work in our marriage and our hearts; drawing us closer to one another over distance, encouraging more vulnerability than we had seen in each other up to that point. Our God was gracious; Brad found another job back here in Denver, with a a ⅔ pay cut (ouch) and arriving home just 4 weeks before our youngest was born! To say that it was a tense season, would be an understatement, but we made it and are better for it. Boy where we happy to have him home with us. Good to look back at where we’ve come from sometimes, what God has brought us through. Now would be a good time to preheat your oven to 400 degrees. After you’ve allowed your dough to rest for about 20 minutes in the package on the counter, turn it out onto a generously floured surface. I find it’s easiest to just turn the bag inside out and let the dough plop on the surface. Using a [amazon_textlink asin=’B000SSZ4Q4′ text=’bench scraper‘ template=’ProductLink’ store=’thefreshcoo0a-20′ marketplace=’US’ link_id=’5fef7249-6eaf-11e8-a0e6-d39cef49b9a1′] or knife, cut the dough in half or thirds. Then [amazon_textlink asin=’B01H8NOXK4′ text=’roll’ template=’ProductLink’ store=’thefreshcoo0a-20′ marketplace=’US’ link_id=’351e60f2-6eb1-11e8-8400-63a81f28aed0′] it out flat, not too thin, you don’t want your ingredients oozing out onto the baking sheet. About the size of a small pizza, or slightly under the size of a dinner plate. You don’t need to be precise. 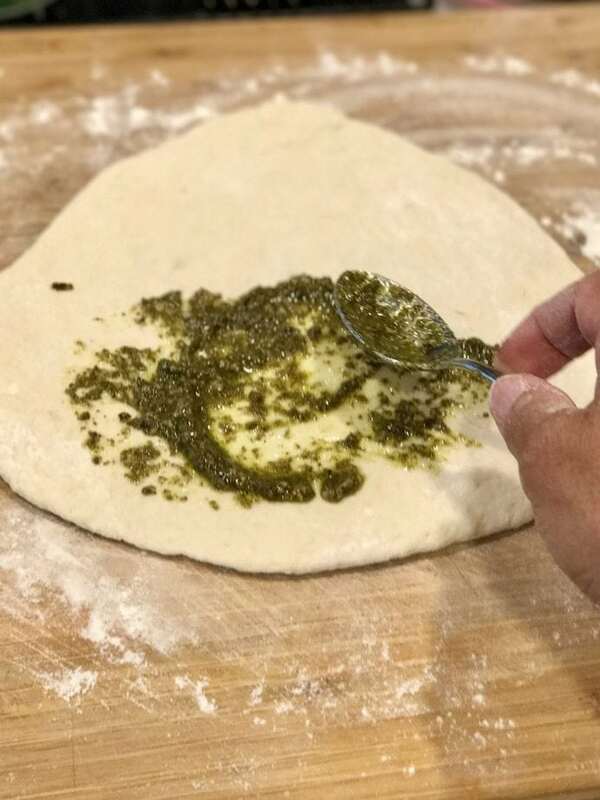 On one half, spread on a little bit of pesto sauce (I like this in place of spreading some pizza sauce, as it doesn’t get the dough too mushy). But don’t worry, you’ll still have red sauce, lots of it, hot and ready for dipping! Next place on your other desired toppings; I put sun-dried tomatoes and caramelized peppers and onions. 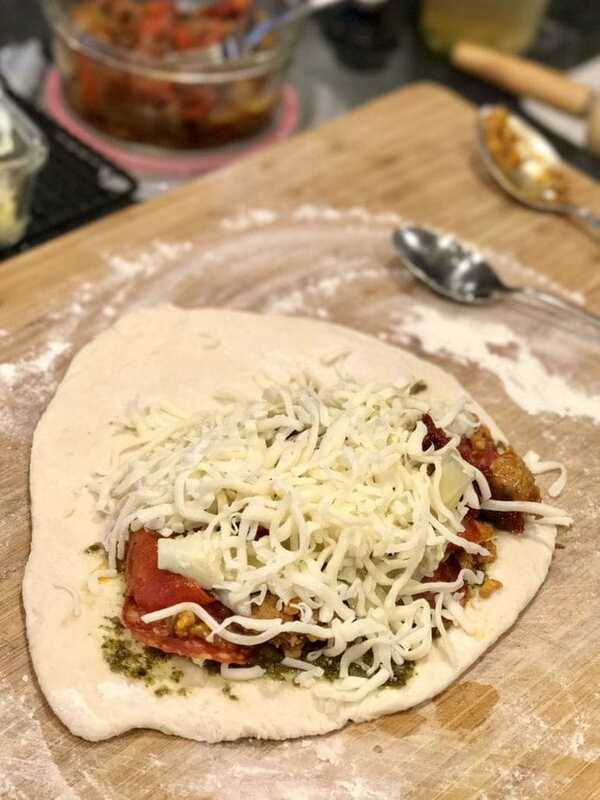 Then fold the top over, pushing, stretching, maneuvering all of your toppings to stay in your dough pocket you have created. It stretches further than you’d think. Crimp and pinch the sides and edges together, to make a good and full seal. If needed, rub your finder on the inside of the edges to help seal the edges together. Then using a sharp knife, cut 3-4 slits into the top, to allow for venting during baking. Next, if desired, brush lightly with a little olive oil and sprinkle with a little sea salt. Or if a glossy finish is desired, brush with a beaten egg. I used olive oil for mine, for the more rustic look, sprinkle with a little flaky sea salt. Place calzone’s on a parchment lined baking sheet, this comes in handy if you are making customized calzone’s, as you can write on the parchment whose calzone belongs to whom. Repeat above steps until you have finished all of your calzone making. You can fit about 4 on a [amazon_textlink asin=’B01AGQ027S’ text=’large cookie sheet‘ template=’ProductLink’ store=’thefreshcoo0a-20′ marketplace=’US’ link_id=’d51d2815-6eaf-11e8-a72f-257e60136745′], but try to give them a little space between, they will rise slightly with baking. Bake at 400° for 10-20 minutes, depends a lot upon the thickness of the dough, the amount of toppings. They should be bubbly and nicely browned. 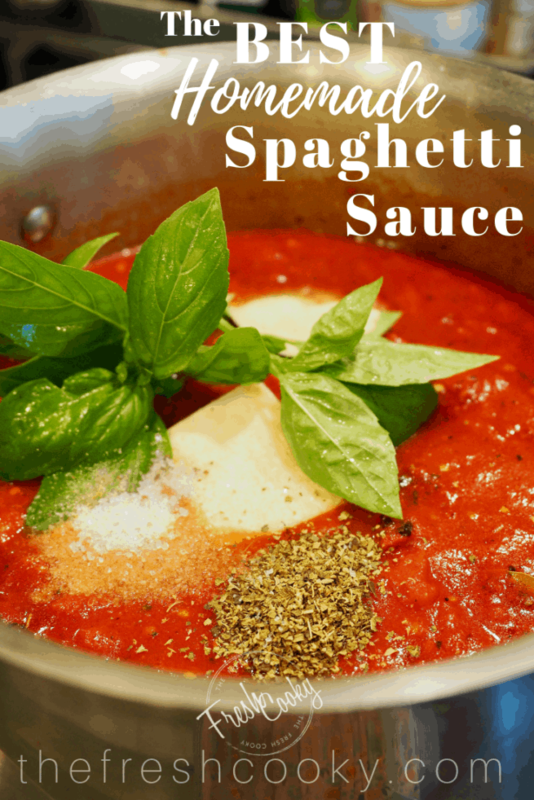 Meanwhile, heat up your favorite marinara or spaghetti sauce. 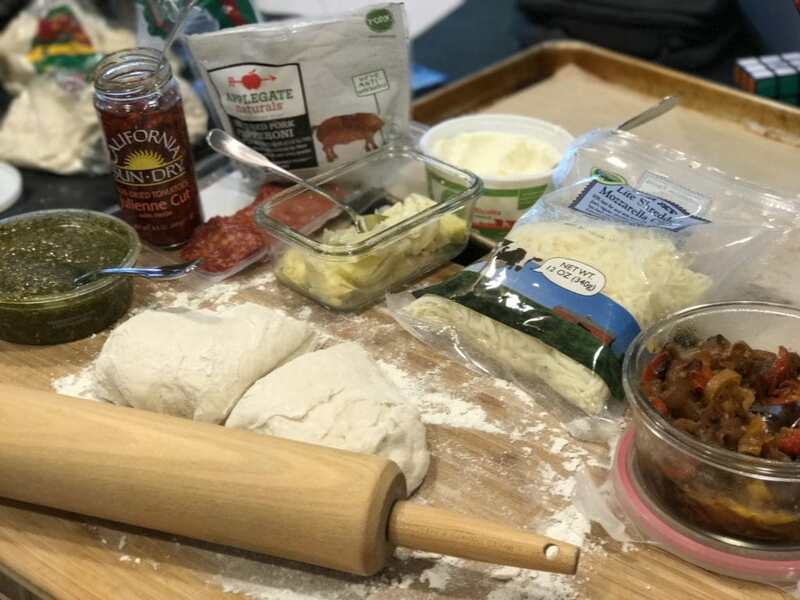 In fact, I will typically make these in tandem with making my Grandpa Frank’s Spaghetti Sauce, because it is so delicious to dip in to each bite of these wonderful calzone’s. But again, a jar of marinara sauce will work just fine! Watch them after about 15 minutes if they have risen and are nicely browned and you see a little cheese or something bubbling out of one of the sides, they are done. 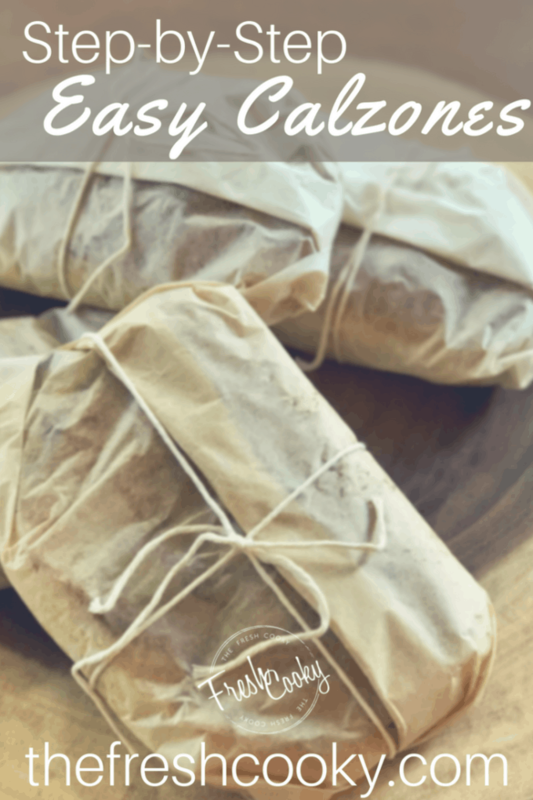 These freeze beautifully, allow to cool completely from oven, then wrap in parchment or wax paper, sealing tightly in a freezer ziplock baggie removing as much air as possible. If you freeze some, you may slightly undercook them removing them around 12-15 minutes. To reheat, from frozen place on cookie sheet in a 350° oven for 15-25 minutes. If thawed, bake slightly less time. 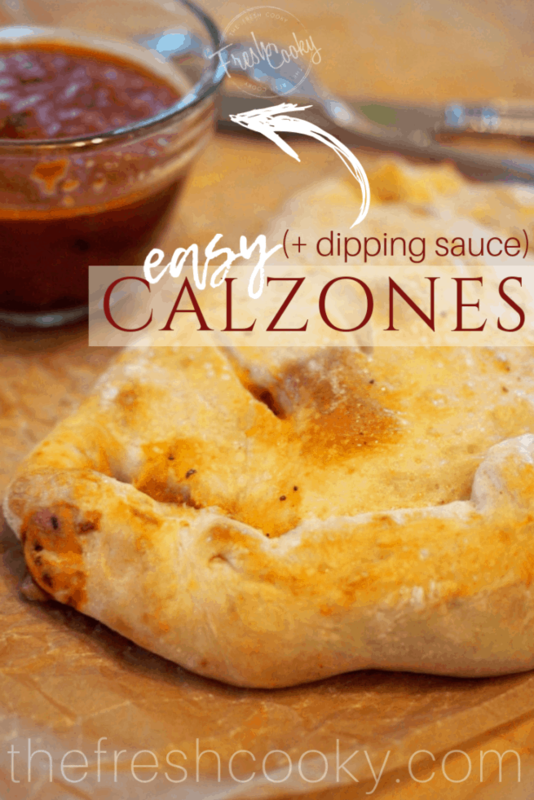 If you enjoy these calzones, give these other recipes a try! Crispy pocket pizza’s, filled with all the best pizza toppings, customized to your taste. Calzones are a wonderful, filling anytime meal. Perfect for an easy weeknight dinner, an alternative to pizza night or just for snacking! On a generously floured surface turn out dough and using bench scraper, cut into 2 or 3 even sections. Roll out one section at a time, to small pizza sized shape (slightly smaller than a dinner plate). 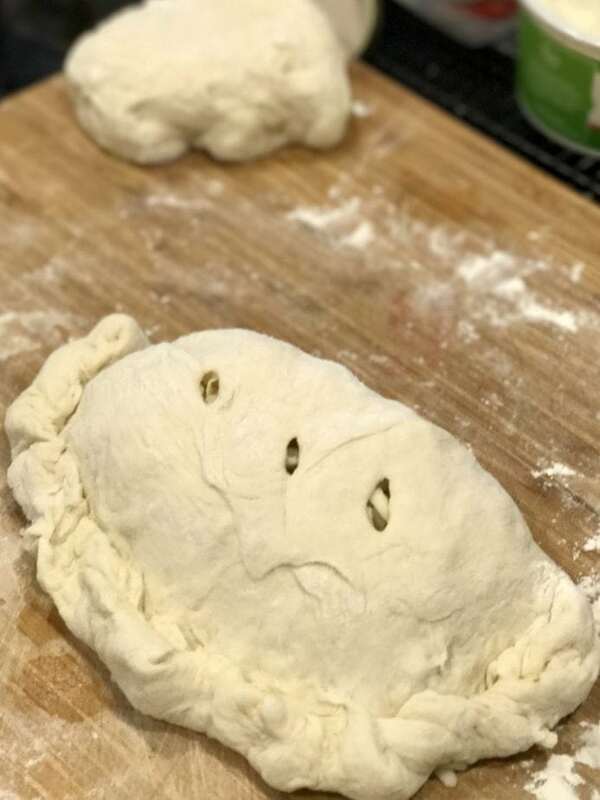 Fold the unfilled half over the fillings, stretching the dough so that you form a half moon. Pinch edges together, if necessary, rub a bit of water between the seams and then pinch together, securing a good seal. Gently move calzone’s onto a parchment paper lined baking sheet, if desired, write names on parchment for each calzone. Using a sharp knife, slice 3 little slits in the top for venting. Repeat steps until finished with dough, each baking sheet can hold about 4 smaller sized calzone’s. Brush tops with olive oil and sprinkle with a little kosher sea salt. Or if glossy finish is desired, beat an egg and brush on top of calzone, sprinkle with a little kosher sea salt. Bake one at a time at 400 degrees for 15-20 minutes, until browned and bubbly. 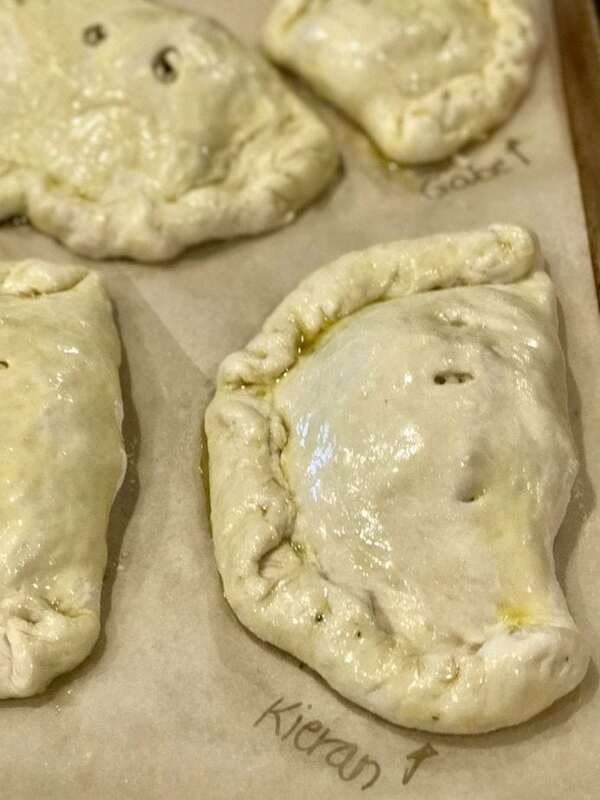 If freezing, allow calzone to cool completely (slightly undercook at 12-15 minutes) before wrapping in parchment or wax paper. Wrap tightly in parchment or wax paper, place in freezer ziplock baggie, squeeze out all air and freeze. Heating instructions for frozen calzone’s, 400 degrees for 15-20 minutes. Slightly longer if cooking from frozen. 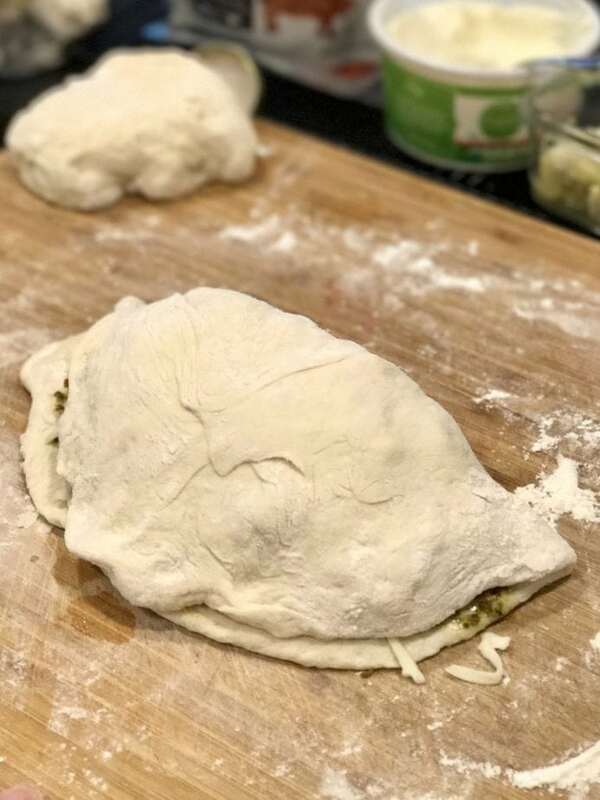 Copyright 2017 | This recipe for Easy Calzone’s was featured first on The Fresh Cooky.